Blog IS CRYPTOCURRENCY A CRIME? I am not a bitcoin expert but I have understood it to a level that will perhaps help you decide whether you want to invest. In a nutshell, bitcoin is a global decentralized software protocol built around the premise that no single entity such as a bank or nation should have control over the currency. The platform serves as a means of exchanging value between peers but it also offers a means of storing wealth in a potentially appreciating way, like an investment. Bitcoin supply is capped at 21M and software developers and miners of bitcoin have aligned incentives to ensure that the system is transparent, non-fungible, and irrefutable. The technological advancement that enables this is known as the blockchain. The blockchain is an accretive, linear, and inviolate public chain of blocks forming a ledger. This public ledger is verified and maintained by bitcoin “miners”. Miners have computers that race to decrypt the submissions to the public ledger; if they win the race, they might be rewarded with bitcoin every 10 minutes. The “crypto” in cryptocurrency comes from the fact that decryption algorhythms are required by the miners to verify new transactions (i.e. “did Alice have enough bitcoin to pay Bob? Ok. Alice checks out and now Bob has those bitcoins. My computer has verified this by decryption and hopefully I’ll be awarded the next 10 minute reward of bitcoins for my efforts”). Because what has occurred in the past is agreed upon in the canonized public ledger, no one has any incentive (can’t win a block reward) or ability (everyone has already signed off on the ledger) to change the records, which is very much unlike the way governments, academics, and bankers operate. Since the dawn of time, the fruits of labor and of the land have been concentrated in the hands of the cunning by tokenization. Whether it be gods that demand tribute or gold, people crave control over avatars of wealth. Why? Because most of us will not grow wise enough in a single lifetime to see past the illusions of the reality with which we are presented. A currency is something that is generally in circulation for exchange of value. In 2009, the pseudonymous author of a paper, Satoshi Nakomoto, published a paper and released a version of software outlining the peer-to-peer electronic cash system that we now know as Bitcoin. Currencies ideally have the traits of being hard to counterfeit, readily trusted as a form of value exchange, and immediate. In this regard, bitcoin originally only fulfilled one of the three criteria. It was nearly impossible to counterfeit because the blockchain is a distributed, public ledger of who owns what and when and is therefore not elastic like fiat currencies (which nation states can print as they see fit). It was not recognized as valuable because well, nobody thought it was valuable; as tautological as that seems it is true that a person paid $26M for a 15 dollar pizza delivery only 6 years ago if we translate the past value of bitcoin into present day exchange rates. Immediacy is relative: waiting a minimum of 10 minutes and a maximum of hours to exchange bitcoin is slower than handing over a Jackson at a newsstand but faster that a 2-3 day bank or credit card round trip. Debasing the currency is a term that we should now acknowledge. Coinage from late antiquity was debased (mixed with non-precious metals) to fund wars. Even the “eureka” moment of Archimedes and specific gravity comes from the fact that pure gold or silver is often debased to stretch value. This brings us to the modern era of fiat currency in which every government can print, ad infinitum, as many bills, bonds, and notes as it desires without facing an real supply/demand comeuppance. It is sleight-of-hand and working people will always be needed to bail in or bail out those who create bubbles from credit. You cannot debase bitcoin and for that reason, some viewed it this virtual currency as a hedge against manipulation of monetary policy and other asset classes such as precious metals, real estate, stocks, and bonds. As someone who has been paid and has purchased with cryptocoins, I will tell you that the bookkeeping is prohibitively onerous for Americans because it deemed to be property, not currency and even tipping someone $1 in bitcoin generates a taxable event. In other nations where bitcoin is not taxed when used, this may not be the case. Here the language fails us because commodities are thought of as low value. In truth, a commodity such as water or pork bellies can have fluctuating value depending on the circumstances. Commodity only implies that there is a finite supply and if you think about the roughly 24 paintings of Leonardo DaVinci, you can see that some commodities can be precious indeed. Bitcoin fulfills the criterion of being a commodity because barring any forks (divergence of the blockchain) and revisions to the plans of the developers, there will never be more than 21 million bitcoins in circulation. Here is where the cubist painting that is cryptomania eludes macroeconomic thinkers. Logically, bitcoin has no value but then again, neither does any fiat currency save for the fact that the communities still believe that Switzerland and England will still be in existence months and years from now. The fact is that 24-hours a day, someone will pay you actual dollars, yen, and euros for bitcoin so for now, it is a precious commodity and a means for storing value across borders. 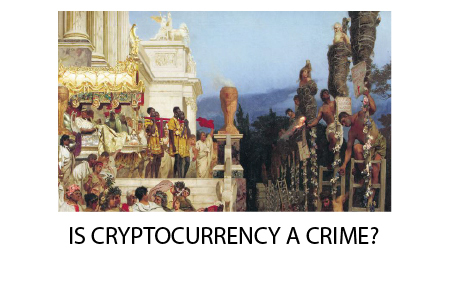 Before you discount the bitcoin community, recall that at one time Christianity was a fringe sect withing the greater Roman Empire but a community grew around it and eventually, it overthrew the pagan gods and the old order and coinage. We all belong to a community of believers in the all-mighty dollar. The notes read “In God We Trust” but in reality, we are trusting in the Federal Reserve Bank. Unfortunately, fractional reserve banking is an oxymoron if you consider there are no fiat currencies that offer exchange of paper for fractions of gold or silver as in days gone by and there are no pretenses that such reserves should even exist. If you watch It’s a Wonderful Life and comprehend why the FDIC was created, you will realize that every bank and every government that issues currency is actually insolvent. Now that the Kissinger petrodollar regime is collapsing with the sale of Aramco, battery-renewable economies, and the sale of Saudi oil in denominations other than the USD, people are guessing at what the next community of shared value will be. If it weren’t for the existential threat that cryptocurrencies present, I might say that something like a bitcoin might provide such an alternative regime. This brings us to the final summation of why you should probably NOT invest in bitcoin. Governments will allow it while they can redistribute wealth and tax the gains but if it were ever allowed to be adopted as a currency, then the results would be disastrous. Firstly, the value is too volatile to rely upon. Secondly, every transaction is a bookkeeping nightmare because it is property with capital gains/losses instead of straight exchange as with all nation-state currencies. Finally, if privacy is secured between peers, then the government loses the ability to monitor, tax, and control commerce. In case you missed it, India tried to ban higher denomination bills overnight in November, 2016 and then reissued them in a rather breathtaking bid to gain control over money and what it felt was an “underground” economy. Money is power and the powerful don’t relinquish it as long as they can point the business end of a gun at their citizens. A government will minimize the maximal bad outcome: loss of control of power. People will minimize the maximal bad outcome: going to prison. China once burned its ships to prevent merchants and warlords from overthrowing central control. Now they are banning bitcoin miners in a bit of historical rhyming. Now that bitcoin options contracts and institutional funds are playing in the cryptocurrency space, the prices can be manipulated as easily as the price gold and silver or the LIBOR market. A final note about arbitrage. The reason that China can get away with a non-floating monetary policy and still be included in the IMF SDR basket is because of political power. For other currencies, the foreign exchange markets offer a stabilizing influence among peers of essentially useless paper. Because cryptocoins can be exchanged quickly and anonymously, there are double digit arbitrage opportunities 24 hours a day and the prices of coins can rapidly become untethered by laws of gravity or fundamental analysis (such as business model and market capitalization). A massive exodus of fiat money into virtual wealth will not be allowed as long as central bankers can convince the legislators and judges to abjure virtual tokens as non-legal currency. Of course, there is no difference between the tokenization of airline miles and the latest ICO, but airline miles are seen as a benign and even helpful invention. In the ever-expanding cryptoverse of hundreds of coins, there are few that will provide a useful function and most will therefore become extinct. At the moment, governments are unwilling to act in concert to outlaw them but such an action will likely come in the next several years. Just as people don’t make titanium coins, there can only be a few recognized “gold standards” and if you are going to bet on just one, bitcoin is likely to be a survivor for historical reasons. It is not the best technology for speed, privacy, or usability, but it has the strongest community. Granted, there could be a “black swan” event in the financial systems that cause a temporary flight of capital out of the traditional financial system but in the end, people want to believe in a system that is designed to siphon off and concentrate value into the hands of the few. N.B. : I am not endorsing or decrying the way of the world; I am merely describing what I see. If you were to ask me how I would change things, then this blog explains how we could evolve out of out current paradigm without violence or revolutions. The Telomere Miracle: Scientific Secrets to Fight Disease, Feel Great, and Turn Back the Clock on Aging. In it, I explain things of much greater value than just what Caesar would have you render unto him. I will explain the stuff that truly makes life golden: breath, thought, sleep, movement, food, and supplements. Render unto yourself things that are yours. 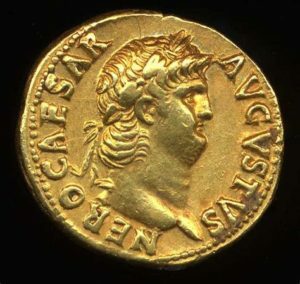 People once trusted in the currency, commodity, and community represented by the cult of Emperor Nero and his gold coin. Nero punished suspected Christian arsonists by burning them as human torches. He certainly could not have imagined the many generations that would live to pay gold tribute and fight and die under Christianity dominion for the next two thousand years. Currencies and commodities wax and wane, like Roman or Chinese dynasties. What cannot be underestimated is the fearsome power of a growing and passionate community. That is why bitcoin went from worthless to $15,000 per coin in just 7 years and why it will soon be made illegal by the caesars of our day.